Senator Elizabeth Halseth is a proven conservative who brings common sense to government. 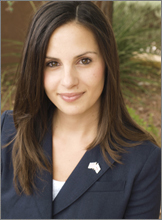 Elected in 2010, Halseth is the youngest female in Nevada’s history to be elected to the Nevada Legislature as a State Senator. Although first elected to public service at the age of 27, Senator Halseth began serving her community at the young age of five by volunteering at local retirement homes and health care facilities. Senator Halseth, along with her three children, continues to stay actively involved with their community and civic causes. Just finishing her first legislative session, she served on the Senate Revenue Committee, Senate Commerce, Labor and Energy Committee, as well as the Senate Transportation Committee. She was a steadfast supporter of conservative causes in the Legislature and looks forward to continuing her service as a State Senator.